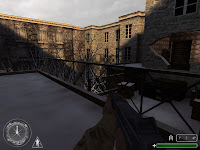 You get extracted in the first of four big sp-maps as a American soldier somewhere outside a big German city with 3 other soldiers at the end of the second worldwar in the year 1945. Your mission is to fight your way trough the city to a little hotel. Somewhere in the basement of that hotel a English spy is held in a jailcell. He was captured on a secret mission as a high German general to collect classified information.The SS will interracate in the next few days and it is very important that you find him before the SS can get information out of him. Therefor you have to free him and lead him out of the city, you have to succeed, whatever it takes. I have encounter a wierd problem with this release (You can pick up german wepaons but mostly they are all empty of ammo). It could only be fixed by remove all custom pk3 files from main and UO folder. The Second release for Call Of Duty from Mr Brinkman is in all part a lot better as it's first one. This time, some scripted objective (only in map 4) . and prouve that the team with baltic is quite efficiant. Design is well put together with a good looking to scale, realism in a mix between outdoor and indoor places (like is other release for COD2). This release is only focussed on a city where you will need to sneak from place to place. The way you move through the whole place and in all directions from cave to upper floor in a constant progression, really keeps, through the whole release, the spirit of going further. Gameplay is perhaps the part i didn't like too much. At start, and for one third of the first mission, you will progress with your squad make it quite easy to avoid the very first ambushes. when after arriving on a central road with huge door and cars the rest of the squad will be stuck behind a grid and won't help you till this moment. objective is for arround 80% of this release a streight forward progression where only aim is to kill and survive. Respawn of enemies make a good challenge to this release with mostly goo placement but certainly create an unreal mission (over 300 germans to kill...) that in some place will wait for you arriving to rush wish heavy machinery in tiny place (the best example is the MG42 in the prison cave to free the Lieutenant(map4)). This certainly increase the durability of the entire release but will create in several place quite frustating moment. Scipting is mostly absent but when you will encounter some especially map 4 is well put together. In conclusion: This map like all other releases from Leon is really well design and correctly scripted (for the small parts). There is certainly a huge amount of hours (during the 8 weeks of construction) that have been spent to create a suppose from scratch level divided in 4 maps. 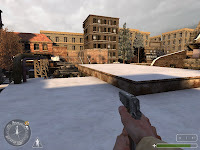 I was a little confuse also by some 'Frensh decals' used as publicity on house that should be german and when looking to screenshots, building houses create without classic rooftop wasn't really the generality during WW2. Appart from those minor glitches it's another really recommended one, especially for people who likes to have heavy fight during a consequent period of playtime.